Join bestselling author Mindy Starns Clark as she shares fascinating insights into the writing process for The Amish Clockmaker, the third and final book in The Men of Lancaster County series. What surprised Mindy about her research on clockmaking? What challenges did she and her coauthor Susan Meissner face writing about Amish culture in the 1950s? Learn the answers to these questions and more in the following interview. 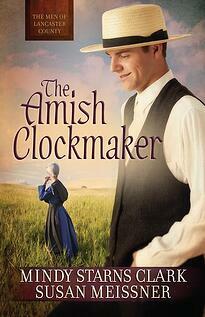 The Amish Clockmaker is the final book in The Men of Lancaster County series. Where did the idea for the plot come from? Mindy Starns Clark: Susan Meissner and I started this one with just a title, actually. 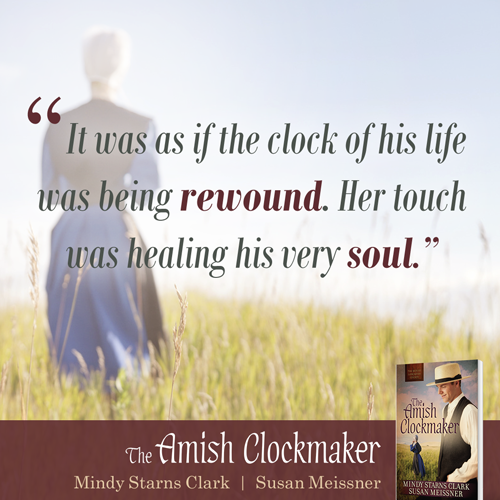 We loved the idea of an Amish clockmaker and could almost imagine who he was and what he was like simply because of his craft. We were eager to make our third and final book in the series one that blended my knack for creating compelling mysteries with Susan’s gift of writing engaging “time slip” novels. So we went with two storylines—one modern and one historical—where our modern-day hero works to solve a mystery surrounding our historical hero. Did you learn anything particularly surprising about clockmaking while conducting research for this book? Mindy: Yes, I was surprised to learn that clockmakers aren’t necessarily good at time management. These folks who have dedicated their lives to creating objects that track the passage of time are often the very ones who work too many hours, are late to engagements, can’t estimate the time required for various tasks, and so on. That struck me as funny at first, but then I realized it does make sense in a way. A good clockmaker needs to be a perfectionist, and perfectionists will often toil many hours longer than planned to get every aspect of their project just so. Did you come across any roadblocks or issues in researching Amish culture as it was in the 1950s? Mindy: Yes and no. 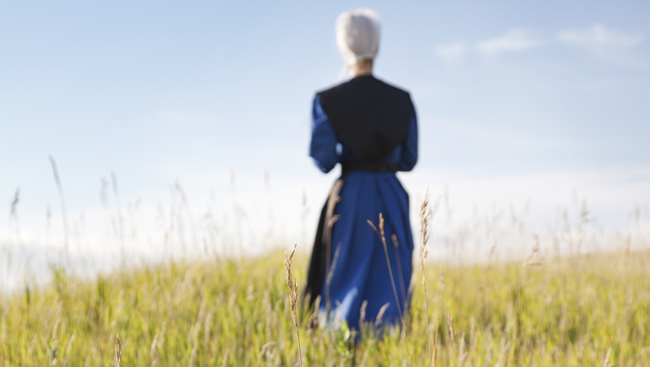 Thanks to research I’d done for my nonfiction books about the Amish (including Plain Answers About the Amish Life), I already had a good “big picture” perspective of the Amish in the 1950s and other eras. Where we ran into problems, however, was with the more detailed elements. You’d think it would be easy dealing with a culture that hasn’t changed all that much over the years, but there were many aspects of Amish life in the '50s that we weren’t sure about. For example, most English homes had indoor plumbing by then, but what about Amish homes? Were they still using outhouses? What sort of heating systems were allowed? Did they take jobs working for non-Amish? Was tourism an issue for them back then like it is now? Practical matters like that. Susan and I were pretty stumped until we met a lovely woman who was raised Amish in the 1950s, and she agreed to answer our many questions. She was a wonderful resource and able to tell us almost everything we needed to know to make the story as accurate to the period as possible. The Amish Clockmaker focuses more on married couples, as well as the fears and uncertainties that come with starting a new family. Was it easier or harder to write the story because of that? Mindy: When we first started on this book, I was surprised to find that it was actually harder to write about characters who were married. A good pre-wedding tale is easily filled with emotion—highs and lows and drama and longing and fulfillment—so there’s plenty of fodder for a story. A good post-wedding relationship, however, is almost the opposite, the drama of courtship having given way to a far more mature, even-keeled, and loving existence. That may make things more peaceful in real life but can leave a lot to be desired when it comes to plotting a novel! Fortunately, with this book’s two storylines, we were able to face this challenge in two different ways. The modern-day couple is married and loving and stable, and the conflicts they face come from external sources which they must deal with as a team. Our historical couple, on the other hand, starts out unmarried and must face serious challenges to their relationship all along the way, both before and after the wedding. 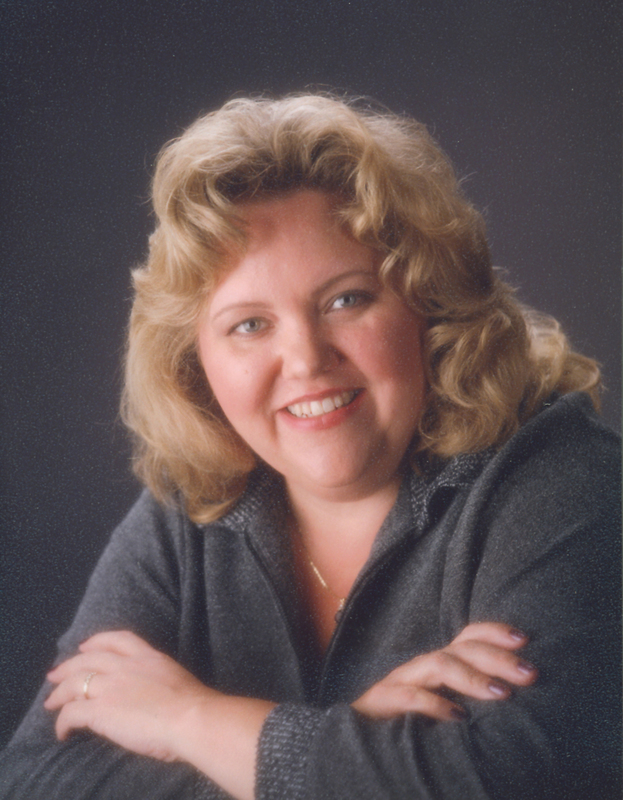 Mindy Starns Clark is the bestselling author of more than 20 books, both fiction and nonfiction (more than 800,000 sold), including coauthoring the Christy Award-winning The Amish Midwife. Mindy and her husband, John, have two adult children and live in Pennsylvania. Visit her online at www.mindystarnsclark.com. Want more glimpses behind the scenes of The Men of Lancaster County series? Be sure to read this interview with Mindy and Susan Meissner on Book 1 (The Amish Groom) and an additional interview with coauthor Susan Meissner on Book 2 (The Amish Blacksmith)! I have been working at Harvest House for 13 years in August. As the Accountant at HH, I produce reporting as well as the monthly financial statements for the company. My favorite thing about working at HH is the sense of family here. There are times of joy, times of sorrow, as well as, times of chaos, which are all things we as individuals deal with in our own immediate families. The people I work with here are one of the other things I enjoy about HH. This company is full of compassionate, caring, and understanding individuals which today is sometimes hard to come by in the working world. Harvest House is an enjoyable place to be each day. People might be surprised to know that I have known my husband since grade school. We attended the same grade school, he then moved around with his family while his father worked, and came back to attend part of middle school and all of high school here in Eugene. We began our relationship in 2001 and we have now been married 10 years this August and have 3 wonderful children. Copyright © 2011 Harvest House Publishers.